EC-2018XTR Echo Power CB Microphone from RF Limited is a two-way radio digital echo microphone for the 21st century. Take your Citizens Band or Ham radio to the extreme with Endless Echo, Double Talker, and Noise Reducer. You'll get the powerful sound from your CB radio that will rock the air waves! 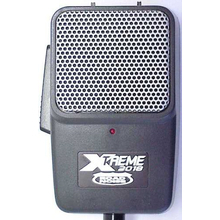 The XTREME 2018 from RF Limited is a feature-packed 4 pin CB microphone. The EC-2018XTR power mic combines noise canceling, echo, amplification, and talk back all in one microphone! Enjoy creating wild sound effects with the XTREME 2018 mic, even with a stock radio. The XTREME 2018 mic requires a 9 volt battery for operation (not included). Cyborg Robotic Voice allows you to sound half man, half machine! Stadium Sound will give you a booming voice like that of a stadium announcer. Adjustable Talkback lets you monitor your transmissions and know what you sound like over the air!